Here's F-35 Joint Strike Figther-maker Lockheed Martin's updated response to yesterday's news that the cost to purchase and sustain the Pentagon's fleet of 2,443 F-35 Joint Strike Fighters over the next five decades has grown to $1.45 trillion. It seems they got their dollar amounts wrong in the first response. Today, the Office of the Secretary of Defense issued to Congress the 2011 F-35 Selected Acquisition Report (SAR). It included estimates of the total cost to develop, build, operate, upgrade and maintain all aspects of the F-35 program and its military support infrastructure for the next 55 years. The total estimated cost, including adjustments for anticipated inflation—which represent more than one-third of the total—is $1.51 trillion. The cost projections estimated in the SAR are based on a number of variables that are subject to considerable fluctuation over the next 55 years, making the estimate inherently imprecise. For example, media reporting on the 2010 SAR estimate included only operations and support costs, while recent reports on the 2011 SAR estimate add the cost of acquisition and development which the U.S. government currently estimates at $396B. This results in the appearance of cost growth year over year. The DOD’s decision to shift the delivery of 179 aircraft beyond 2020 also added cost growth. This shift caused a $60 billion increase in operations and support costs due to inflation and the two-year program extension. The SAR estimate also added four squadrons, grew staffing requirements and increased scope. For example, the 2011 estimate added 2,650 personnel for maintenance and security for the U.S. Air Force at an additional cost of $24.3 billion. The government also included the cost of lifetime modernization to the aircraft to improve its capabilities — expenses that are not included in the cost projections for other aircraft. Lockheed Martin remains confident that F-35 operations and support costs will be comparable to or lower than that of the seven legacy platforms that it will replace. The F-35 also provides our Armed Forces and allies with the unprecedented 5th Generation fighter performance capabilities of radar-evading stealth, supersonic speed, agility and the most comprehensive integrated sensor package of any fighter aircraft. The F-35 will achieve cost advantages over the platforms it will replace by leveraging economies of scale – gained through deployment by the three U.S. service branches and international partnerships – and a common logistics, maintenance, training and supply chain infrastructure. The F-35 will also achieve lower or comparable operation and support costs than legacy systems while providing greater capabilities. 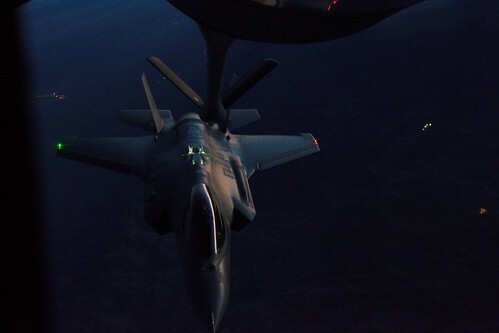 Lockheed Martin believes there are realistic opportunities to further reduce the cost of the F-35 through manpower adjustments based on the aircraft’s reliability and maintainability, planned support concepts and adjustments to basing. We are committed to working with our partners and customers to efficiently and effectively produce an affordable F-35 for our Armed Forces and allies. Q1. What costs are included in the SAR projection that estimates F-35 Operations & Support (O&S) costs will exceed $1 trillion? A1. Any estimate that projects costs for 55 years of operations of a 2,443 aircraft fleet is going to result in a large figure. In fact, more than one-third of the F-35 O&S cost projection is assumed inflation over the next half-century. What is important is that F-35 O&S costs will be comparable to or lower than that of the seven unique legacy platforms it will replace, while providing our Armed Forces and allies with unprecedented 5th Generation fighter performance capabilities, including radar-evading stealth, supersonic speed, agility and the most comprehensive integrated sensor package of any fighter aircraft ever. The F-35 achieves cost advantages over the platforms it will replace by leveraging the economies of scale – gained through deployment by the three U.S. service branches and international partnerships – and a common logistics, maintenance, training and supply chain infrastructure. Long-term projections like these are useful for identifying potential cost risk areas and in enabling the program to develop mitigation strategies for the next 50+ years, but they need to be viewed through that long lens. The entire Lockheed Martin and F-35 teams are continuously focused on further reducing overall cost. Q2. How has the recent program restructuring affected O&S costs? A2. The recent decision to delay production of 179 F-35s to beyond 2020 has resulted in a $60 billion increase in operations and support costs because these aircraft will now be delivered in later years when inflation is factored in at a higher rate. The delay also extended the program life cycle by two years. Q3. How was this estimate calculated? A3. Never in the history of U.S. aviation has the Pentagon tried to project the cost of an aircraft program over a 55-year period. The F-35 is the first aircraft program to undergo this type of review. The cost figures recently released for the F-35 represent projections for a half-century of supporting 2,443 aircraft within 111 squadrons at 49 bases around the world in future-year dollars. More than one-third of this estimate is assumed inflation. Because the F-35 is not yet fielded, a large percentage of the estimate is based on legacy historical costs—from other aircraft—and does not fully reflect design and maintenance attributes that were designed into the program from the start to reduce overall lifecycle costs. We expect to realize the benefits of these attributes as the program matures. In fact, 50 percent of the design Key Performance Parameters—which we met—were associated with minimizing sustainment costs. Lockheed Martin is fully committed to fielding an F-35 that is both effective and affordable.